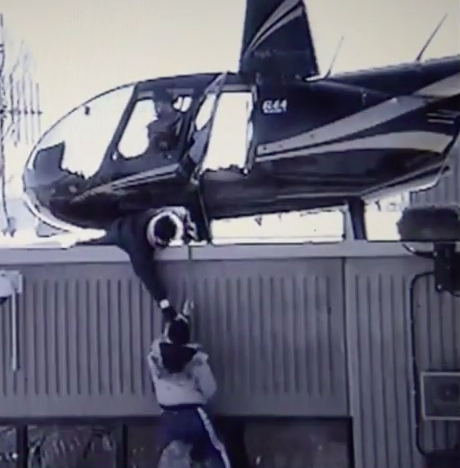 A dramatic video of two Canadian inmates escaping from prison by helicopter has emerged – and it’s like something straight out of Mission Impossible. Well, maybe a Mission Impossible where Tom Cruise has never worked out in his life, anyway. These guys hardly made it out of there – but it’s hilarious to watch. The footage was filmed by guards at St-Jérôme Prison in Quebec, Canada in 2013, and the video has just come to light during an unrelated trial of one of the escapees, Bejamin Hudon-Barbeau, Sky News reports. The pair of escapees made headlines a few years ago when Hudon-Barbeau and another prisoner, Danny Provencal, broke out of a Montreal detention centre. And now, finally, the video of the daring escape has been released. The footage shows the two inmates trying to get onto the prison’s roof by scaling the side of the building. After a major struggle, they give in and cling to the helicopter’s rope which carries them away. The armed accomplices who helped them apparently posed as tourists in order to hijack the helicopter and forced the pilot to land on the prison’s roof. Despite their massive effort to escape, the pair were caught just a couple of hours later and were charged for hijacking a helicopter and escaping prison. Wondering why the guards didn’t do anything? Sky News says the union that represents the prison guards said they didn’t have guns to confront the armed accomplices, so their only option was to watch the drama unfold.